Carlsberg is up for an exciting dream come true contest for the New Year celebration. This time it will be for the fulfillment of Mike's Wishes. And Mike needs our help in making his dreams come to reality this coming year 2010. 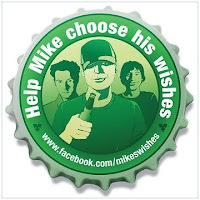 In fact, Mike has six wishes and it's all in the hands of the people in which wish is going to be granted. And the good news about this is that by participating and casting your vote, you'll have the chance to win amazing cash prizes and tickets for the Celebrate 2010 in Singapore. The announcement and final celebration of the fulfillment of Mike's wish will be held right exactly on New Year's eve Celebrate 2010 at The Float in Marina Bay, Singapore. There are two ways to vote. You can vote via Mike's Facebook Fan Page by visiting the link provided or you can send your votes through SMS with this format: Carlsberg Name NRIC Wish#(1 to 6) and send to 78111. For the Wish#, you can refer to items provided below. Vote now and help Mike achieve the best wish in the world. Visit the link for more info.